It may not surprise you that I have a thing for lesser-known Nintendo characters. I blame Smash Bros., I guess, for reminding us with every edition of bygone franchises and protagonists that never saw a proper sequel. 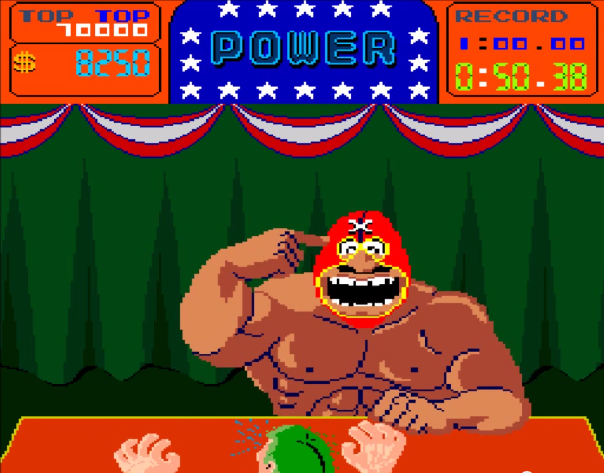 Maybe one of the lesser less-known Nintendo titles ever would be Arm Wrestling, a spin-off to the Punch-Out!! franchise released only in arcades and, even then, only in those located in North America. As far as I know, this might be the first Nintendo-developed title never to see the light of day in the company’s homeland. I don’t know why it showed up here and not there, but I think it’s too bad. I remember playing this long, long ago and enjoying it. 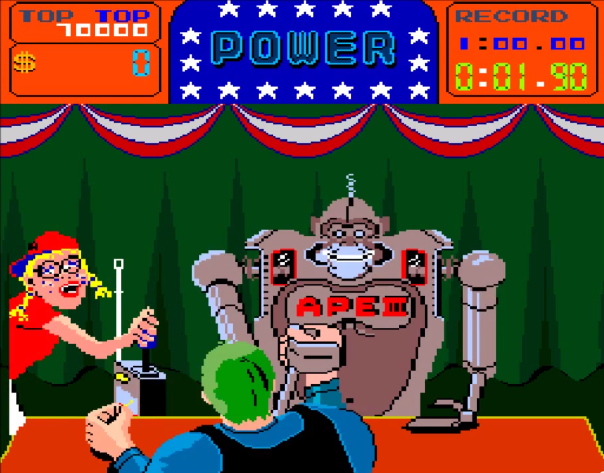 I even tried to find a port of it to the NES but couldn’t: Arm Wrestling never saw a second life on a home console. Also working in the game’s favor is its appealingly oddball mix of characters. They wouldn’t be out of place in a Nintendo game today. Nintendo has, after all, stayed weird. 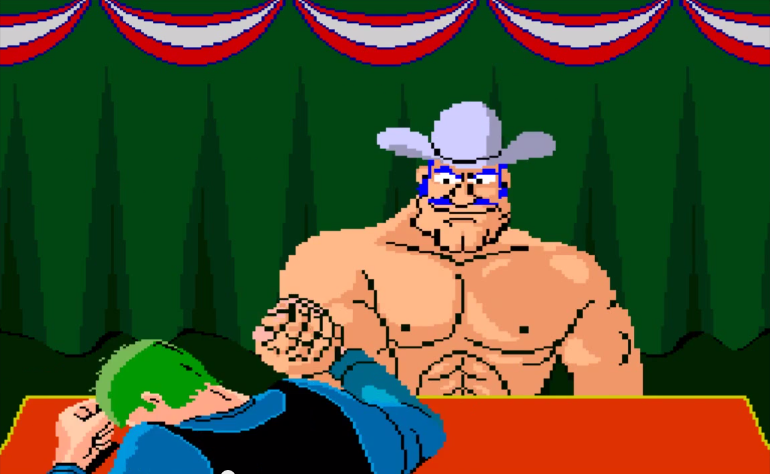 I tried to see if any site featured large-ish sprites of Arm Wrestling’s opponents and couldn’t, so I’m just going to post them here. First up: Texas Mac, a ripped, bare-chested cowboy with a Falcon Studios mustache. I think I know why he likes holding hands with other strong men. 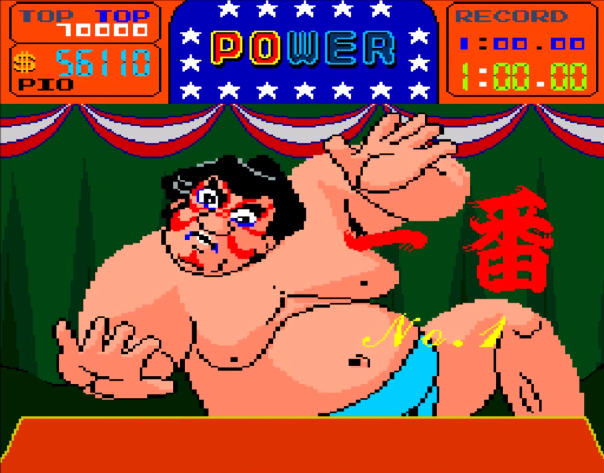 Second: a sumo named Kabuki. 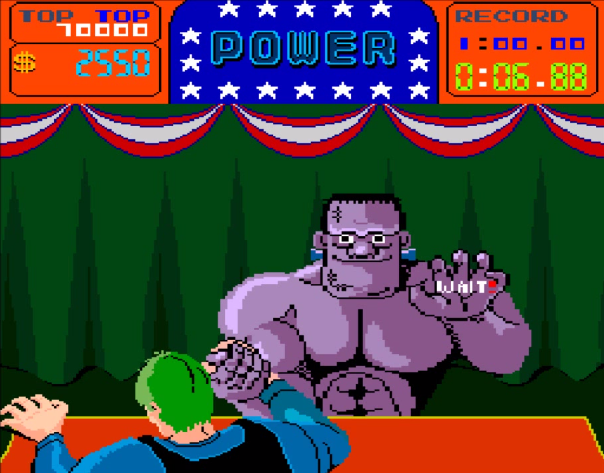 Before you accuse him of being a rip-off of Street Fighter’s E. Honda, know that Arm Wrestling came out six years before Street Fighter II. If anything, E. Honda ripped off this guy, but I’m not sure how common it is in Japan to see a sumo wrestler wearing face paint. Every town has one, I’d like to think. Billed simply as “Who?” he’s actually just Bald Bull from Punch-Out! !, wearing a mask for no discernible reason. You can even unmask him. Fourth and by far the best of the group: Alice and Ape III. Yes, you have to best one of the more tragically awkward little girls in video game history in the form of her hulking arm-wrestling robot. They’re billed as “Best Friends,” and I can’t tell if that makes me sad for Alice or jealous of her. And yes, if you squint right, she does look just a little bit like a later-generation Nintendo science whiz, Penny Crygor. Finally, you must fight Frank Jr.
Frank Jr. gets no nifty intro text, because if you can’t tell who he’s supposed to be, you are culturally illiterate. All character images taken from this YouTube video save for “Stud-Horse,” which came from Wikipedia. Tetris & Dr. Mario, Dr. Mario 64, and the both StarTropics never saw releases in Japan! Derp, I didn't catch "first" there! Having one Japanese character and naming him Kabuki is like having a Hawaiian character and naming him Hula. I'm not sure that hasn't been done... maybe not by Nintendo, but man, that sounds familiar. There was once a Plastic Man cartoon show in which he had a stereotypically sidekick named Hula-Hula. I'm not sure about fighters, but I could see a nifty stage coming out of this. Giant arm wrestlers, their matches going back and forth, and if someone "wins" by pressing the other guy's arm down on your character, big damage. But which way will they go? Wholeheartedly supported! Nintendo, are you reading this? 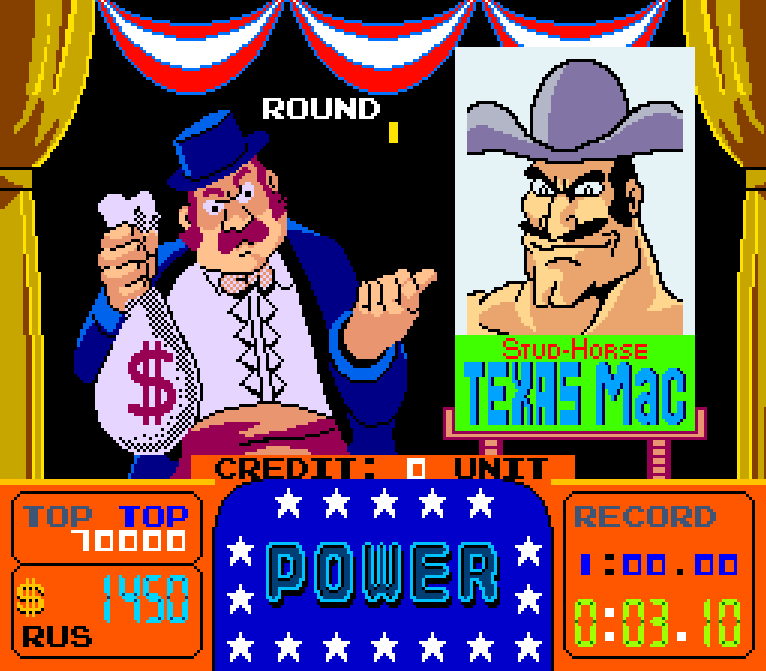 Texas Mac for Smash. (Or anything.) Colt Studios needs a bigger video game presence.